Russians’ high level of confidence in their president’s ability to do the right thing regarding world affairs endures. A full 87% have some or a lot of confidence in Vladimir Putin’s handling of global issues, a share that has held relatively steady since the outbreak of the Ukraine conflict in 2014. More than half of Russians express a lot of confidence in Putin, though this number has slipped since 2015 from 66% to 58%. He gets lower ratings among Russians who are unhappy with the country’s economic situation, however. Only 46% of those who think the economy is bad have a lot of confidence in Putin, compared with a full 70% of those who think the economy is good. Despite the durability of Putin’s overall rating, his performance in handling specific issues has taken a hit since 2015. 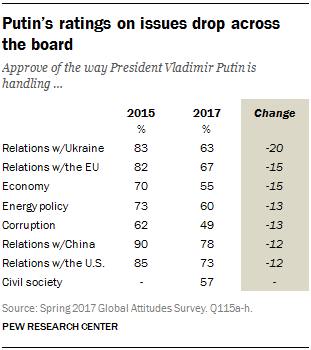 Across seven issues, approval of Putin has dropped by anywhere from 12 to 20 percentage points in the past two years. Although his approval on handling relations with China is currently his strongest issue, support for Putin on that measure dropped 12 points since 2015, to 78%. On other foreign relations matters, approval has dropped similarly. Putin’s handling of relations with the U.S. dropped from 85% in 2015, when Barack Obama was still U.S. president, to 73% in the first months of the Donald Trump administration. His handling of relations with the European Union dropped 15 points in two years, to 67%. And the share that approves of the Russian president’s handling of relations with Ukraine has dropped by 20 points since the annexation of Crimea three years ago (83% in 2015, 63% in 2017). On domestic issues, Putin’s ratings have slipped in the areas of energy policy (from 73% approval in 2015 to 60% today) and the economy (from 70% to 55%). Putin’s marks for reducing corruption have also fallen over the past two years, from 62% to 49%. A 57% majority approves of Putin’s approach to civil society (the question was asked for the first time this year). Older Russians, in addition to viewing the issue of corruption as more problematic than younger Russians, are also less satisfied with Putin’s handling of the issue. Less than half (46%) of those ages 50 and older approve of Putin’s handling of corruption, compared with 57% of 18- to 29-year-olds.